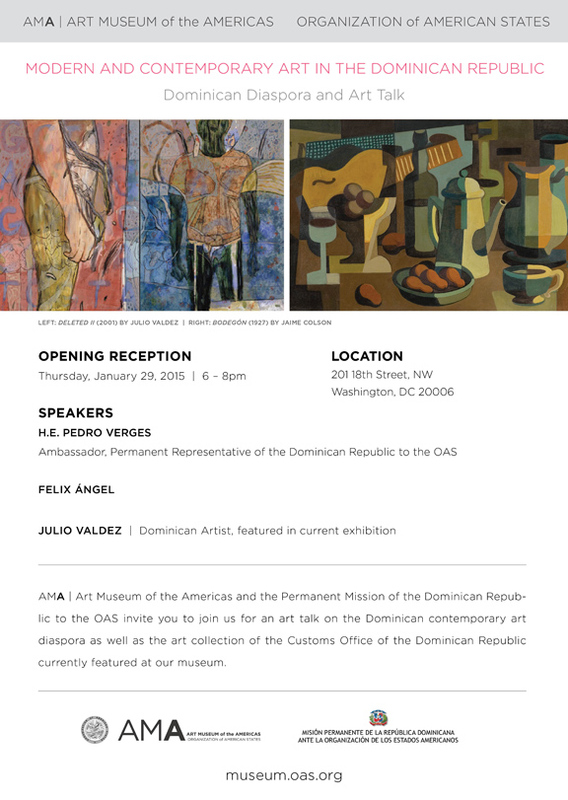 Modern and Contemporary Art in the Dominican Republic: Works from the Customs Office Collection is an initiative of the Cultural Heritage Foundation of the Directorate General of Customs and the Permanent Mission of the Dominican Republic to the Organization of American States (OAS), with the collaboration of AMA | Art Museum of the Americas, OAS and the Embassy of the Dominican Republic. The exhibition, which is organized in conjunction with AMA | Art Museum of the Americas, is a scenic view and historic sketch showcasing, through 30 artworks, the consistency, quality, and diversity of the Collection of the Directorate General of Customs. The selection of works sets the Customs Office apart as one of the more important creative spaces in the region. These works allow us to reiterate, along with many contemporary art scholars,that the Caribbean is not vernacular, thus continuing to overcome the bias and old myth that the Caribbean and its art are sheerly exotic.